The cranial cruciate ligament originates on the outside of the thigh bone (femur) and crosses the knee joint at an angle to attach at the front, inside of the shin bone (tibia). This ligament prevents forward movement of the tibia, internal rotation and hyperextension of the knee. Ruptures of the cranial cruciate ligament are one of the most common orthopaedic injuries in dogs. There is disagreement among experts about whether arthritis is the cause or result of failure of the cruciate ligament. However degenerative damage is seen far more often than straightforward traumatic damage caused by falls or twisting. Often the rupture occurs during normal activity by twisting the knee joint during running or jumping. At this point the dog may cry out and hold up the injured leg. In other cases the rupture may not start with a single traumatic event. The dog may just have occasional periods of lameness that worsen with vigorous exercise. 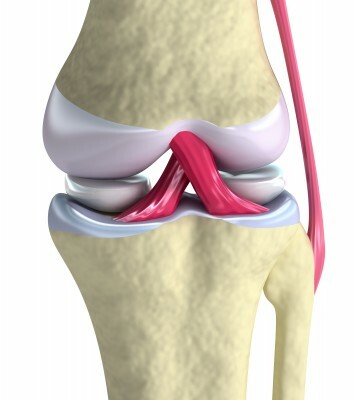 Rupture of the ligament results in instability in the knee. And will produce progressive arthritis or degenerative joint disease due to the instability of the joint. The best treatment available is surgery to stabilise the joint. There are many different surgical techniques available and whatever the type of surgery, all procedures rely on careful post-operative nursing and rehabilitation. Most surgeons recommend very restricted short lead walks only for at least six weeks after surgery. However non-weight bearing exercise such as hydrotherapy can be extremely beneficial in enabling the dog to put the affected leg to the ground during this period. Many dogs refrain from using the affected leg on land, but will freely extend it in the water. The gentle stretching of the muscles and ligaments in the water encourages increased mobility of the joint. Sometimes we find that many dogs are very hesitant about using their affected leg after surgery for fear of pain. However once they have started swimming and extending the leg in the water they often walk out on all four legs.